Cat Women of the Moon: When Felines Attack! Dear Reader, I submit for your approval (I’ve always wanted to use that phrase!) . . . Cat Women of the Moon. 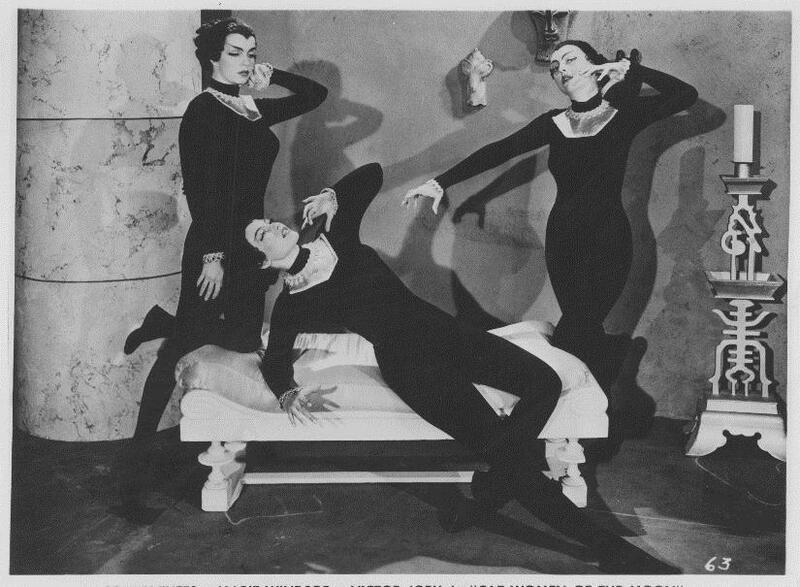 Cat Women of the Moon is a bizarre spectacle. Like so many films of its time, it shows a nefarious feminine presence, resolved through good, ole-fashioned, masculine wherewithal in which the day is saved through a sort of proper gender performance. One of the posters for the release of the film. Forrest J. Ackerman papers, Box 140. UW American Heritage Center. In the film a group of astronauts travel to the moon. The crew is comprised of men except for the female navigator, Helen, who has been compromised by a mysterious, telepathic force. When the crew arrives on the moon, they are greeted by a barren landscape that is devoid of life (the hostile environment is expressed by one crew member’s cigarette that spontaneously combusts, obviously because fire in space is both scary and possible). The crew is led to a cave by Helen, where they are taken captive by a seductive race of cat women (what? why? really?). One crew member is easily killed by the cat women, who use his sexually aggressive nature against him. Another member of the crew is easily seduced and controlled by his misguided trust of women. Photograph from production of the film. Forrest J. Ackerman papers, Box 105, Folder 108. UW American Heritage Center. The wariest and most alert crew member soon learns that the cat women want to take over the earth, in the process destroying all men. Their method: guide a woman to become the navigator of man’s mission to the moon (it is assumed that she would not have been as capable as a man in this endeavor), to steal the ship, and then to take over earth. Simple enough. Yet simply averted by the surviving crew member’s ability to take emotional and mental control over one of the cat women, hence thwarting the end of the earth. Cat Women of the Moon is a wonderful film because it’s so transparent. The parts are ably cast (although at a certain point actresses started realizing they were only being cast as villains or heroines) and the sets are imaginative. The spaceship reminds me of the spaceships my sister and I would create when growing up (because you really can make a spaceship out of anything when you imagine it, and I’m not being ironic). The interior walls of the ship are made out of corrugated tin and the seats of the spaceship look like they came from a movie studio’s accounting department (imagine frustrated accountants trying to stand while doing their work, telling themselves that they possibly couldn’t be paid enough for this work). But authenticity wasn’t the point. When the idea of space travel was still so fantastic, people would have willingly paid to watch a movie featuring strong-jawed space cowboys traveling to the stars in a cardboard box. 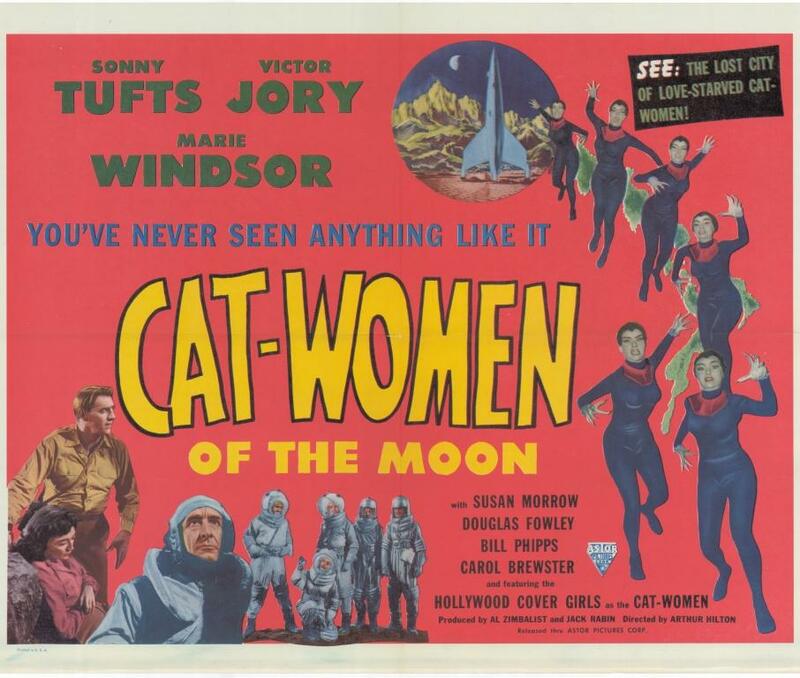 Perhaps it’s a good idea then, to sit back and enjoy Cat Women of the Moon as a film of its time. Because all of it seems so fantastic and ludicrous that it really just is a fun film to watch. And that’s what is so great about the gems of the Forrest Ackerman collection, because they reflect on an era that was deeply troubled as well as fun, which is a perfect combination for academic investigation. This entry was posted in Interns' projects, popular culture, science fiction. Bookmark the permalink. 1 Response to Cat Women of the Moon: When Felines Attack! Too funny to find this posted the first time I came across your blog. Last night my husband and I hooked up the computer to the TV for the first time and randomly picked this movie to watch from YouTube. I literally laughed so hard I couldn’t breathe. Love, love, love seeing the movie poster!